For all self-builders, finding land is the first step towards building a dream home. Whether the plot is a gap in an urban terrace or former farmland in an ‘Area of Outstanding Natural Beauty’, the challenges to bring a new house into being are numerous. Speaking to property agents or looking at auction sales is a good start. Plot finder websites are becoming increasingly sophisticated at bringing together purchasers and plots. One of the most effective ways is to develop relationships with agents, architects and other industry consultants, who are often aware of sites available. Once equipped with your requirements they can assist and better target your searches. Land registry documents can be easily obtained online here for a small fee, these documents will give details of the current landowner. Where can I find land in the UK? In dense urban environments, gaps between buildings, backland garage plots or sub-divided gardens can offer potential sites on which to build a house. These constrained sites can be catalysts for inventive design. In rural areas, there have been some recent planning policy changes to make developing or converting existing buildings possible. One example is the relaxation of permitted development rights to enable the conversion of agricultural buildings into private homes. Elsewhere, a recent surge in demand for coastal living has lead buyers in Devon, Cornwall, Essex, Kent and Suffolk to look for land as an alternative to a pre-existing property. For self-builders of all experience levels, it is prudent to have all the information to assess the viability of your land purchase. The adage ‘buyer beware’ must be at the forefront of the decision. In planning terms, finding land with permission and residential use class ‘C3’ is conventional. Some self-build lenders will lend up to 100% of land costs where planning consent is already in place. Buying land with planning approval in place is, however, likely to carry a premium. Buying land without planning permission is likely to be less expensive. In this case, the purchaser takes on the risk of obtaining consent for residential development. This takes capital, as a loan may be difficult to acquire, and a longer-term view towards development may be required. There are a number of Local Authorities that maintain a register of prospective residential self-builders. These registers help councils to consider planning policies for self and custom build housing, and explore options to make plots available. The first of these incentivised schemes are starting construction in Summer 2018. It is common for challenging constraints to bring self-builders and architects together to unlock and maximise a site’s potential. An architect’s involvement at the earliest stages brings years of training and insight to the table. Our services can be useful from finding land and informing your decision to purchase, to guiding you through the specifics of planning, building regulations and onward to help deliver your build. An architect’s involvement is often highly beneficial to the finished house. It is the timely deployment of architects and other consultant’s skills that can have the most positive impact on a project. The architect’s role is to coordinate, ideally from inception to completion. We are pleased to be working with The Modern House on the sale of a plot at Hopping Jacks Lane, Danbury, Essex. 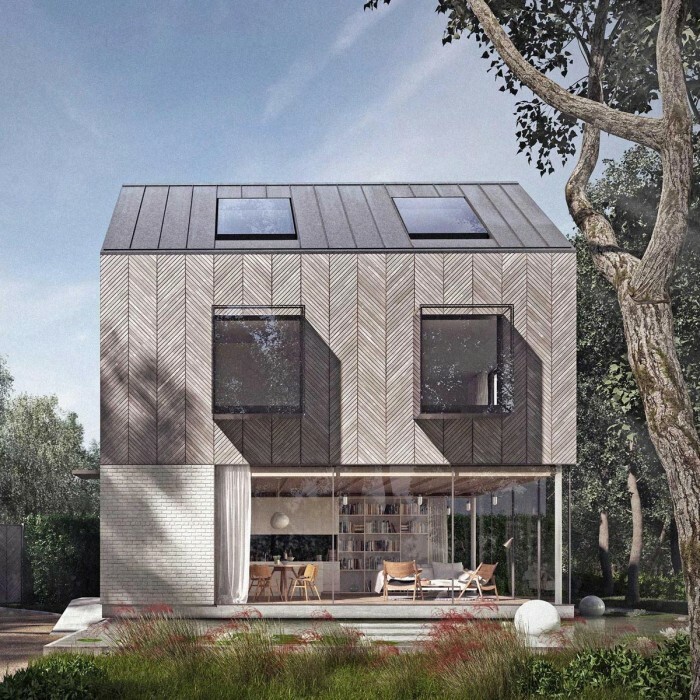 Architecture for London designed and won planning permission for this new build house. The land for sale benefits from a unique woodland environment with mature oak trees. Please visit The Modern House for details and to request a viewing.